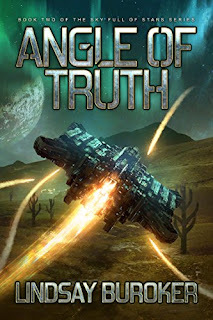 Angle of Truth is the second book in fast-paced, smart and funny space opera, The Sky Full of Stars, by Lindsay Buroker. Angle of Truth is just as witty and engaging as its predecessor, The Rogue Prince, which I reviewed here. Young Captain Jelena Marchenko would never regret saving mistreated animals from a giant corporation, but she does feel bad about the debt incurred by her family’s business from her adventures. Apparently, space bases are costly to repair--who knew? After seeing the bill and her new monthly payments, Jelena turns to her crew for creative solutions, and soon settles on mercenary work. Childhood friend and practiced assassin Prince Thorian warns Jelena that she doesn’t have the cold, killer’s heart needed to be a mercenary, so the team settles for the most heroic-sounding mission: rescuing war prisoners. Jelena Marchenko still has a knack for getting into trouble as she acts on her bright moral principles in a post-war universe. Angle of Truth piles space battles, magic-like Starseer powers, and witty banter onto the platter of a classic SF moral quandary: outsiders interfering in a civil war. The Sky Full of Stars is perfect for voracious readers who enjoy smart and funny characters and plot with soul. Buroker has a great way with dialogue and a good balance of character development and long-reaching plot. Join Lindsay Buroker's email list to keep up-to-date on her releases, and get free content. Buroker is a prolific writer with a variety of series to whet your appetite. Pick up The Rogue Prince and Angle of Truth now on Amazon.